Fancy a bike ride almost naked? Then visit France and enjoy! Do you consider this biker's clothing appropriate for riding? Well the French Government says yes it is! We have just come across the most incredible piece of legislation that could be imposed on the French bikers soon if they don’t fight against it right now. Let us reassure you right from the start – you cannot (yet) ride your bike totally naked but you can do so almost totally naked! The French transport authorities have announced plans to force all bikers to wear fluorescent yellow high visibility jackets (left) in an attempt to reduce the number of accidents involving motorcyclists. But the same authorities have not come up with any requirements for the bikers to wear specific clothing underneath that high visibility yellow jacket. Therefore, a biker who is keen to wear nothing underneath that fluorescent vest is perfectly entitled to do so, the only requirement being to wear that vest and make it totally visible. It is strongly believed among the French motorcycle community that these latest proposals are only designed to issue a higher number of tickets by catching hundreds of bikers a day who fail to wear a high visibility jacket. The government claims that by making bikers more visible, the number of accidents involving motorcycles will decrease. The Fédération Française des Motards en Colère (FFMC – French Federation of Angry Bikers) argues that the proposals are only there to, once again, make more money out of bikers, as it is not by wearing fluorescent vests that the number of accidents will significantly reduce. It is rather by offering more practical training to both bikers and car drivers to raise awareness of each other on the roads that the number of accidents may indeed fall. 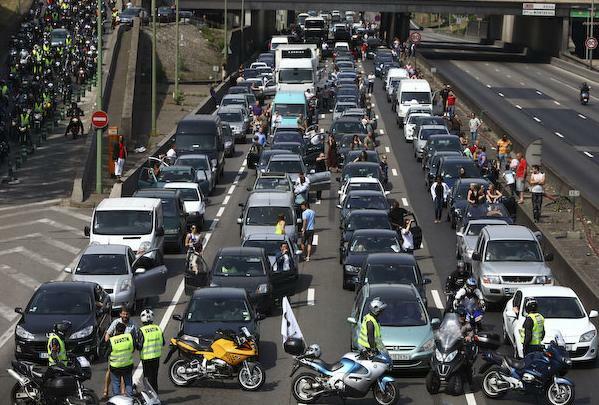 Thousands of bikers bring Paris to a complete standstill while car drivers applaude them for what they're doing! The proposals clearly show a complete lack of understanding of the principles of motorcycling. Whilst the French government is stupid enough to believe that by forcing bikers to wear fluorescent vests the number of accidents will simply reduce, the same government totally ignores the danger of not wearing the appropriate protective clothing while riding. By focusing on what one can see as opposed to what one must wear, the government doesn’t really care about the physical harm that an accident can cause to the body of a biker. As long as you wear the yellow vest, then you’re riding legally – but nothing tells you what you are required to wear underneath that yellow jacket. You are basically allowed to wear whatever you like, even nothing at all if you wish to! Thousands of motorcyclists have joined the FFMC to protest at these stupid proposals that are yet another example of a public authority treating bikers like cash cows. No later than last Saturday (21st May 2011), more than 4,000 motorcyclists took over the streets of Paris, with many of them riding their bike with a yellow vest and nothing underneath, just to prove their point. Did one get arrested and fined by the Police? No is the answer, because as long as you wear that vest, you behave within the law. As Mr Jean-Marc Belotti, representative of the FFMC in Paris said, “one can ride naked, as long as you wear the yellow vest, you risk absolutely nothing: this is indeed the solution to reduce the number of fatalities on the roads, isn’t it?!”. And Jean-Marc continues: “dressed like a clown (yellow vest and short), I can ride a motorcycle and yet remain within the law. Wearing the yellow vest is a non-sense, the problem on the road is not that we [bikers] are not seen, it’s that we are not being watched out for”. 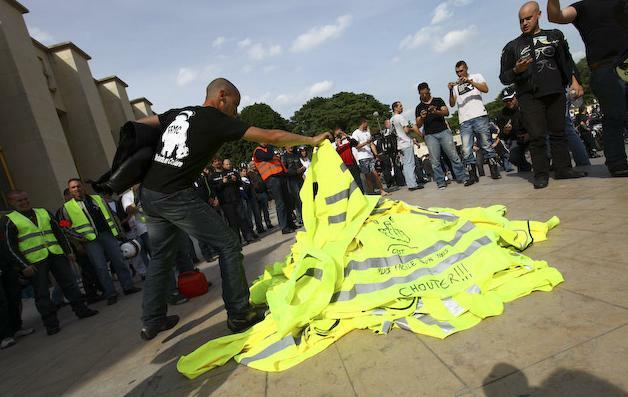 At the end of the protest, the bikers gathered on the Trocadero square in central Paris and put fire to the thousands of yellow high-viz jackets that they had been wearing to show the government that these vests are not wanted and are not the solution to the problem. The bikers demand more training and awareness courses to improve their safety on the roads. We do not know however whether the bikers ended up totally naked after they had taken their high-viz jacket off…! Thousands of bikers are preparing a massive fire of high-viz jackets! Oh no, they are about to annoy Ms Nathalie Kosciusko-Morizet, the French ecology minister! Never mind, after all, she wants bikes out of city centres, so shame on her! Thousands of yellow high-viz jackets take fire in central Paris! The bikers say "death to these stupid proposals"! A series of demonstrations are currently taking place all over France with a massive and enormous national protest scheduled for 18th June 2011, which is expected to be attended by more than 100,000 bikers nationwide. We can expect to see the whole nation brought to a complete standstill, as we have seen many times before! Do you still fancy a trip to France? If so, don’t forget to bring a yellow fluorescent vest and… yourself underneath! We wonder for how many more years, if not decades, we can expect to continue to see France governed by headless chickens. Update 29 May 2011 – If you think this particular piece of legislation that the French government is trying to push through is one of the most poorly thought you have ever come across, then come back to this site soon because our next post will show you an even more stupid and useless measure that the French government is trying to impose on the bikers! Stay tuned. « France to introduce bike registration plates that exceed all sizes !